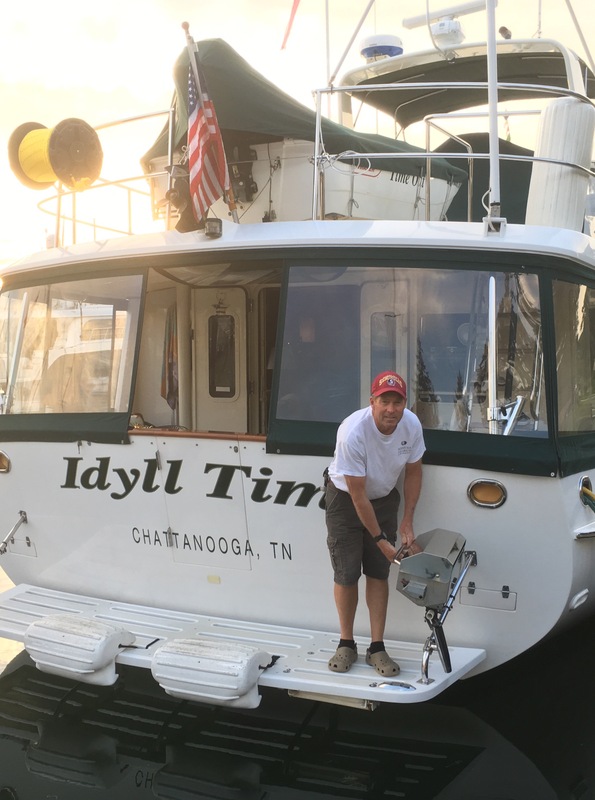 Finally, It is time for us to push away from the docks and start cruising the beautiful Pacific North West waters. Before leaving, we have some last minute adjustments to the diesel heaters. We owe lots of thanks to Ian and Nick from Philbrooks for making a Sunday AM call to the boat for troubleshooting. Yesterday, the heater would randomly shut down and not respond. Of course, it is working perfectly now that the mechanic is here. We decide to go anchor out for a few nights and see what happens. There are still a few bugs to work out. We are waiting for a second water pump to arrive at Philbrooks anyway so we will come back once it is in. We did a short trip yesterday to the U.S. Border and back. Being in Canada on a work order, we had to clear back into the U.S. and then reenter Canada under a cruising permit. With our Nexus cards, this was all done over the phone and we never had to even touch foot on land. Once back into Canada, we loaded Nate and Primo aboard along with groceries and a few other supplies from the RV. After giving IT a good wash, we push away from the Philbrooks docks Sunday afternoon. Lots of other boaters are out enjoying this beautiful July weekend. Normally we don’t like to travel on the weekends but Philbrooks needs this slip for another boat coming in for repairs. It is a great day for boating with just a slight breeze and calm seas. We pass through several areas where the current is a swift 4-5 knots with huge whirlpools swirling. Luckily we are in wide open areas so other than being pushed around a little there is no harm. Crossing Haro Straight, we keep a sharp lookout for the several B.C. 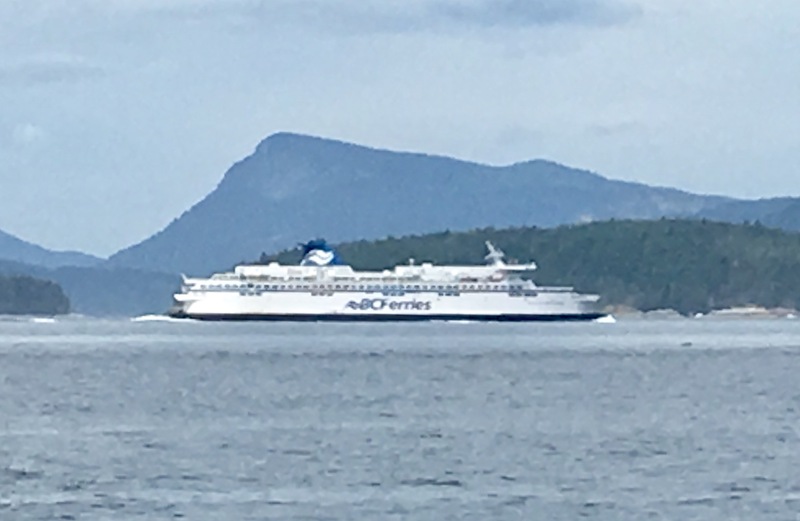 ferries that service the Islands and Vancouver. It is hard for us to judge distances up here due to the height of the mountains. What seems like a small boat in the distance turns out to be a huge freighter or cruise ship. As we travel just north of the U.S. Border along Boundary Pass, the VHF comes alive with reports of a “non-resident pod” of killer whales in the area. Over the course of the afternoon, we listen to the vhf as several whale watching boats follow the pod. Unfortunately we never see them today. 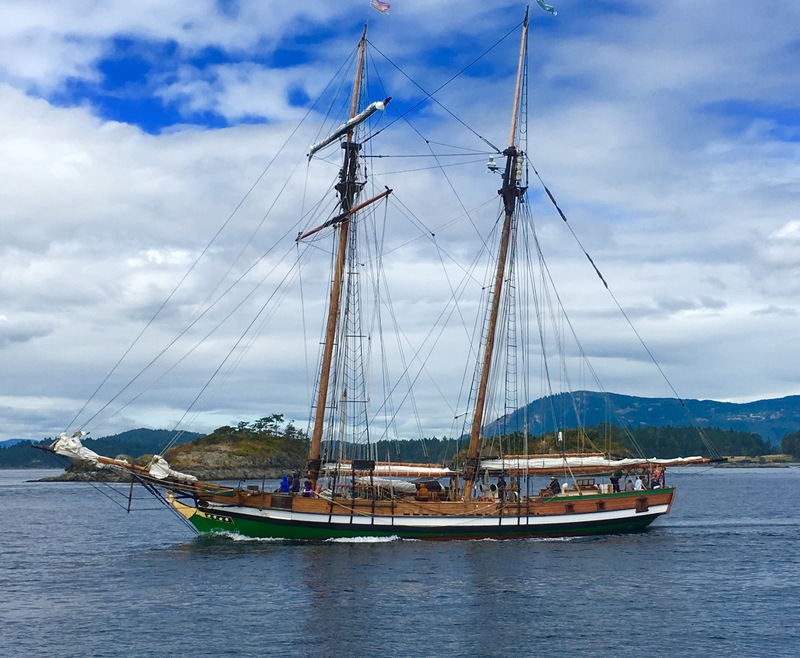 To reach Our first anchorage in the Gulf Islands, we head up Plumper Sound and into Port Browning on North Pender Island. The bay is surrounded on three sides by steep wooded forrest and offers great wind protection. We find a nice spot to drop the anchor between the many sailboats already here. We stay aboard all afternoon just enjoying being back on the water. To celebrate our first dinner on the hook in British Columbia, we grill up some really good lamb burgers. Ugh! Our heater is acting up again this morning. Another call to Ian and he wants us back at their yard ASAP. Exploration of Pender Island will have to wait for another day. Several hours later, Ian is on the docks to take our lines and Ryan is soon aboard troubleshooting. Of course the heater is now working fine again. A conference call is made to the manufacturer. They are asking for pictures of the layout. On top of that, our water maker is blowing hoses. It’s a boat! Looks like we will be here a few more days. Ryan and Nick, our two mechanics, spend the day going over everything and still don’t have an answer why the heater quits. Everyone feels there may be something going on with the circulation pump. During the design phase, we decide to install two circulation pumps, one as the main pump and a second one by its side for a backup. When we initially cranked up the system, the first pump immediately failed. Was this pump just bad to start with or did something cause it to fail? We don’t know. 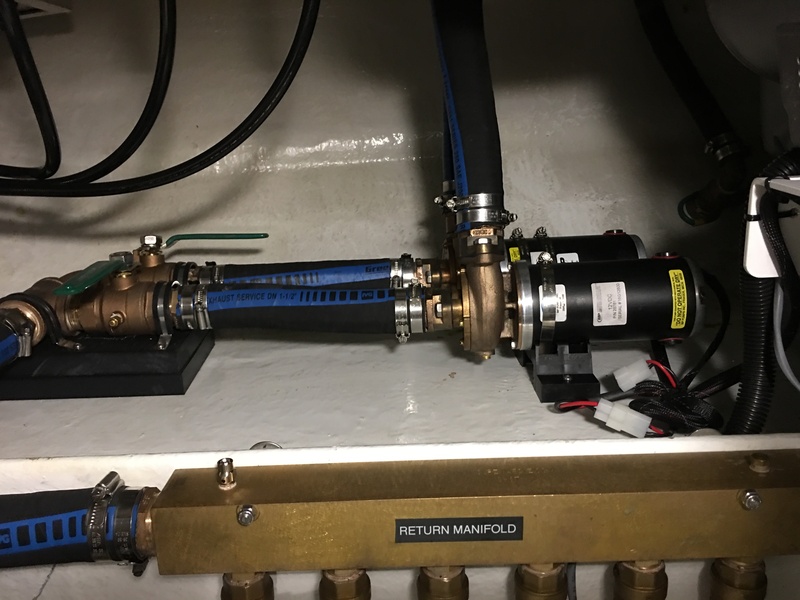 Philbrooks had consulted with the manufacturer before the install and received their blessings on having the two pumps side by side. Now the manufacturer is saying they do not like this design. To make the manufacturer happy, Philbrooks is going to take the second pump out. We are crossing our fingers that this will solve the problem although we are skeptical. But if we don’t change the design, the manufacturer will continue to say this is the problem. We keep watching another boater here at Philbrooks take his dinghy out to set crab traps. Just outside the breakwater is a nice bay where supposedly there is good crabbing. Talking with Joe, we try to gain an education on crabbing. 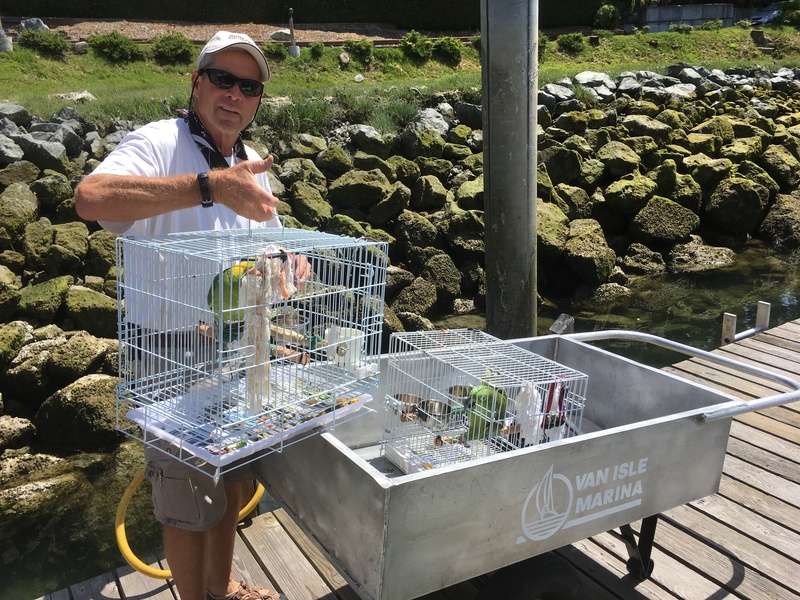 He says the crabbing is only OK here but he does brings back several Dungeness crabs every few hours. 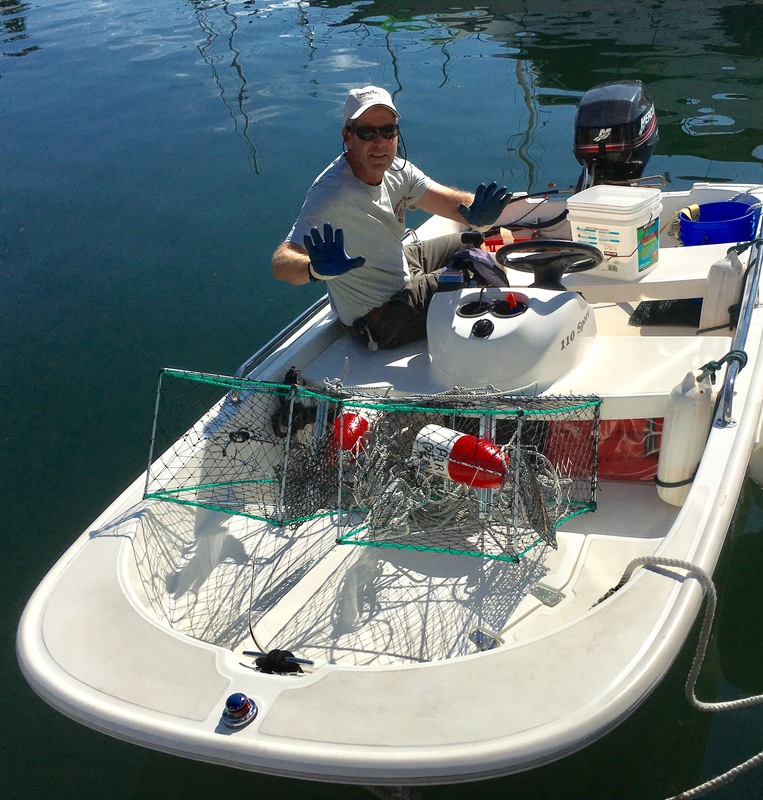 Well, we need to get in on this crabbing also, so Jeff sets up our new crab traps and we head out in the dinghy. 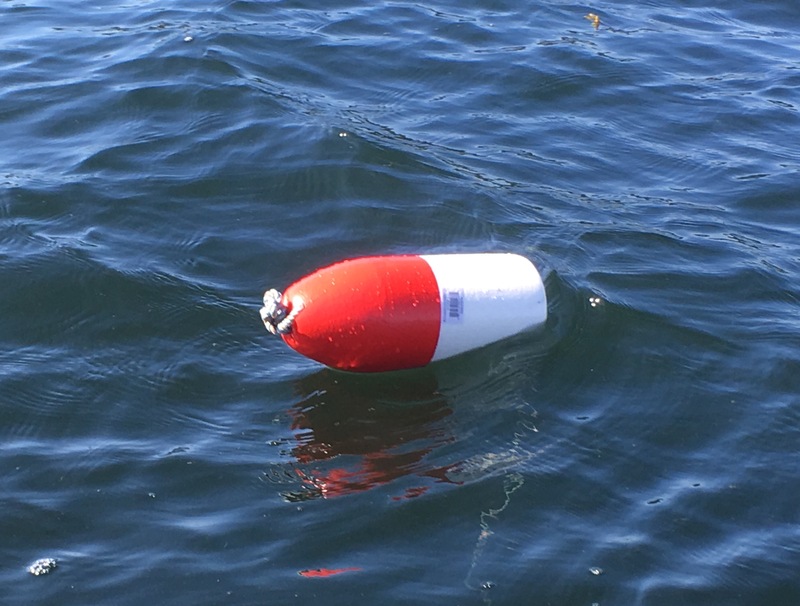 We place our traps in about 30 feet of water along with the many others already out in the bay. We do have a disadvantage from Joe as he is using big chunks of beautiful wild caught salmon filets as his bait. He said he has a freezer full from his fishing earlier this month. We are using the economy bait of turkey scraps. Guess we will see how the crabs like turkey. 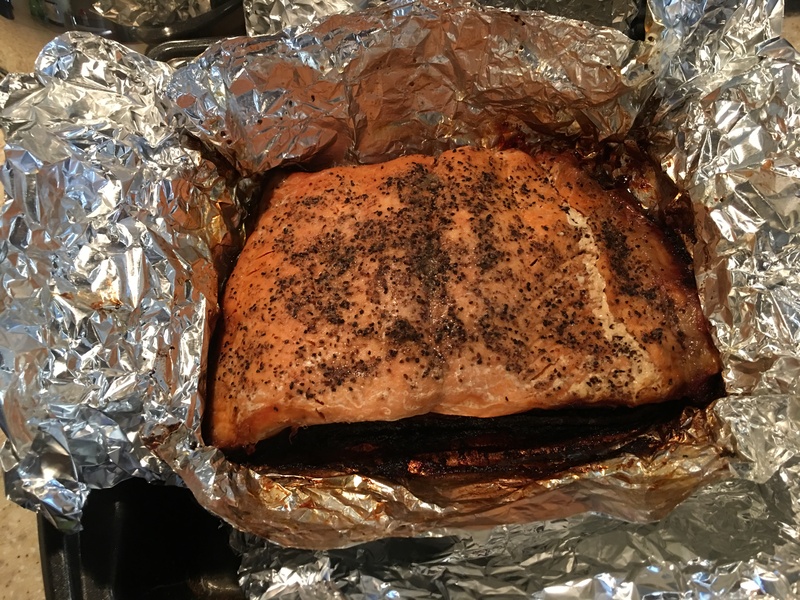 Joe did give us a beautiful piece of salmon filet. There is no way this is going in our crab trap. We dinghy out to our crab traps three hours later. 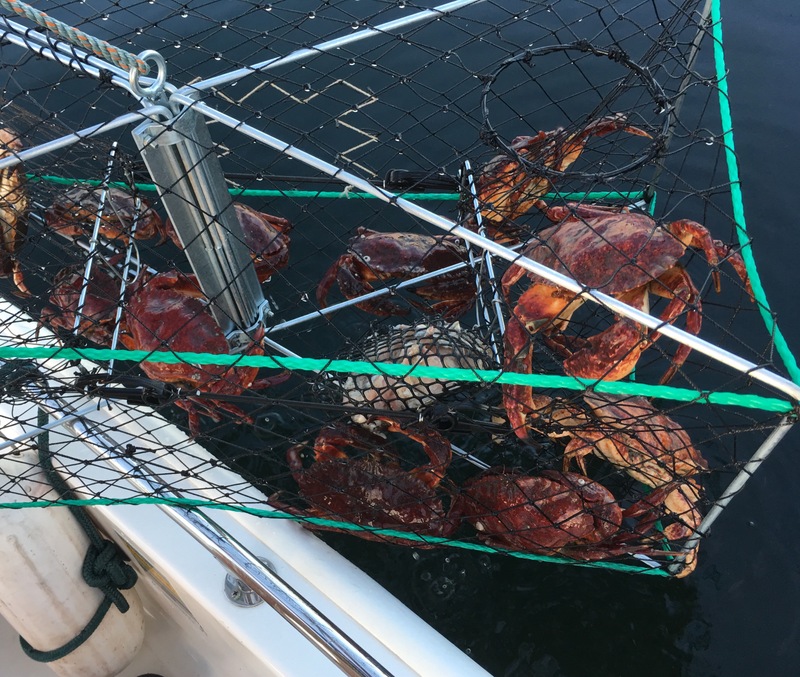 Pulling our first trap, we find it loaded with crabs. There must be at least 14 crabs. Unfortunately these are all Rock Crabs. We could keep them but everyone has told us that getting the meat out of these crabs is too much work. No one keeps the Rock Crabs. It is a little challenging getting these guys to let go of the traps without getting our fingers bit. We next Haul our second trap only to find it completely empty. The two traps were only 30 feet apart but what a difference in the success rate. The only variable we see is that the one with the Crabs was just a little closer to the waterway channel. Well, no crab for dinner tonight but we do have the piece of Salmon filet that Joe had given us. Thank you Joe, it was delicious! After four days at the docks, we are anxious to get back to cruising. Our Watermakers is fixed, we hope. The diverter valve was the culprit. This is the forth one we have replaced. Luckily, we had a spare. On the diesel heater side, Philbrooks has re-plumed the water pump to satisfy the manufacturer. We test the system again and again it fails several times. So, a new control box is overnighted from Seattle. It should be here by noon today. The plan is for us to go out for several days and test the system with the new control box. Hopefully, this will solve the problem. 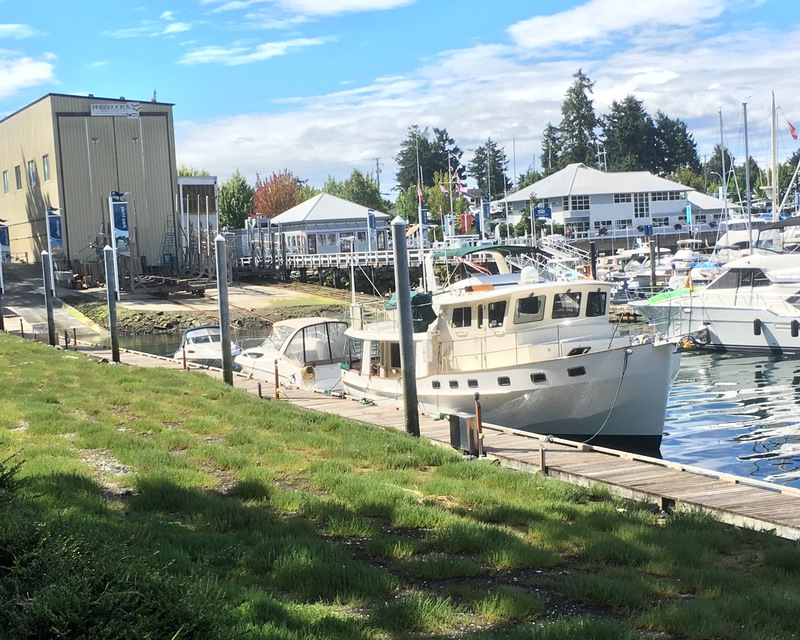 We will go to Saturna Island for the weekend and see what happens. This entry was posted on July 14, 2017 at 5:29 pm. You can follow any responses to this entry through the RSS 2.0 feed. You can leave a response, or trackback from your own site. 1 Response to "The Gulf Islands"
Hello Susie and Jeff, what beautiful photos in the Pacific NW! We enjoy reading about your adventures, and hope all your mechanical problems will soon be resolved. We just lost our refrigeration (the shore assist), but the engine driven compressor still works. Weird to be sitting at the dock running the engine to get the fridge cold! Hope the repairman who said we’re on his list comes very soon!